There’s no better way to spread the love and share a little happiness than giving. Over the past year, we’ve been giving happiness with our letterpress cards and t-shirts featuring instructions on how to be happy – the answer: love-work-pause-play-repeat. And now, Meals on Wheels Atlanta has inspired us to give more. The Meals on Wheels 26th annual A Meal to Remember is coming up November 1st at the St. Regis Atlanta. This black-tie reception will feature a silent and live auction along with a multi-course dinner prepared by top chefs, all of which are volunteers, from all around the country. 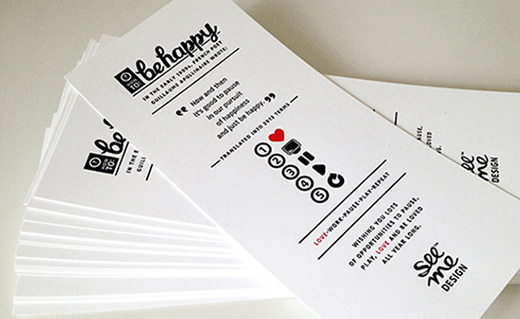 As a small way of saying thanks, each of these chefs will receive a bag of goodies including a little SeeMeDesign happiness – our Be Happy letterpress card and t-shirt. What better fit could there be for our shirts than chefs flying across the country as volunteers to do what they love while helping make the world a better place? Thanks to Meals on Wheels Atlanta for helping spread our love and share the happiness. If you happen to spot anyone in your town with one of our love-work-pause-play-repeat shirts, snap a picture and send it over. You just might win yourself a t-shirt, too!